LOCATION: Oceanfront Kona Coast/Kailua-Kona, Big Island of Hawaii, USA. 25 minutes south of the Kona International Airport, within walking distance of shopping, restaurants, movie theater, and well known Snorkeling Beach, the Kahalu'u Beach Park just 2 blocks North. ACCOMMODATIONS: Condominium, BLDG 5-204 two Bedrooms, two baths, second floor corner unit. This is a VERY PRIVATE unit. No building next door or parking lot outside. NON-SMOKING, NO Pets allowed. New flat screen TV and unlimited high speed wireless CABLE INTERNET MODEM with a wireless printer for your laptop to give you more time after surfing the web to enjoy KONA. Additional TV in second bedroom. ABSOLUTE OCEANFRONT, GATED: Come and enjoy Paradise in our second home. 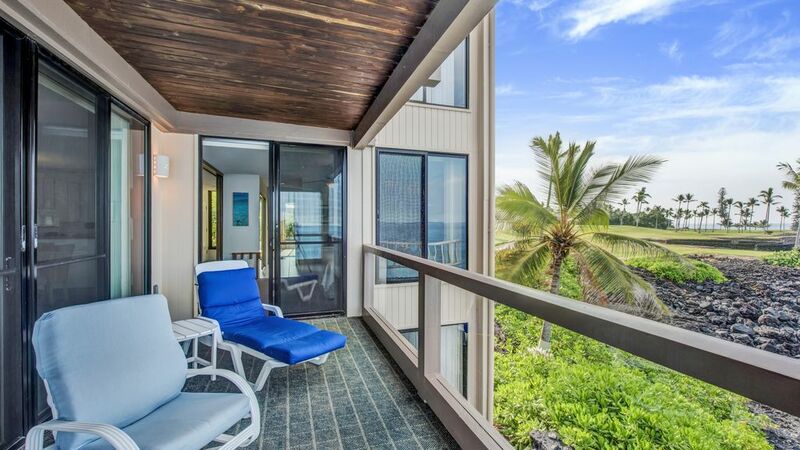 Beautifully re-decorated, second-floor, corner unit which overlooks the ocean and the world class Kona Country Club Ocean Golf Course's signature hole. The Mountain Course is adjacent. From the lanai you have wonderful unobstructed views of the Kona Coast where you can enjoy watching whales in the winter and dolphin year round. The Oceanfront Keauhou-Kona Surf and Racquet Club is located in a garden setting on 17 acres with three lighted tennis courts and a swimming pool. There are gas and charcoal grills and an outdoor picnic area. Our Condo is our second home. The master bedroom has a KING-size bed overlooking the ocean. The guest bedroom has two twin beds with TV overlooking the golf course. A spacious dining room is adjacent to the living room. There is a large wrap-around lanai for outside dining and leisure activities where you will experience the best coastal views and sunsets. We have vacationed in the Kona area many times... we're both retired now and feel fortunate to have been able to purchase this condo and spend more quality time here. The proximity to Kahalu'u Beach Park for snorkeling, Keauhou Shopping Center for groceries, and access to many casual restaurants close by, make the location ideal for us. There is nothing like the sound of ocean waves to lull you to sleep at night. Basics provided, including some spices. Everything was wonderful. Beautifully decorated, well stocked kitchen, very clean. But oh, the view! If you like the sight and sound of the surf this is your place. It was hard to leave the balcony! Thank you for the lovely review... we are delighted that you enjoyed your stay and time on the lanai! The owners are amazing to work with! They do everything they can to make your stay enjoyable! The condo is spacious, and well-equipped with a beautiful wrap around lanai that has plenty of seating and even a fun swing! We thoroughly enjoyed our stay and wish Kona was closer so we could return often! Beautiful location and lovely condo!!! Thank you Christine - we appreciate your feedback and are glad you enjoyed your stay. We couldn’t have asked for a better stay for our family. The condo was well stocked with dishes, beach towels, beach gear, coolers, etc. We had everything we needed. The lanai was the crowning jewel. We spent all of our free time on it watching and listening to the waves, admiring the sunset, and even watching dolphins on our last morning. The kids loved the pool. The condo is close to a grocery and restaurants, and a quick drive down Ali’i Dr for other shops and restaurants. We would definitely stay here again if given the opportunity. We LOVED this condo!! Perfect location & views! Our family thoroughly enjoyed this lovely condo. It was clean, spacious and well-stocked with kitchen, laundry & beach items (chairs, towels, umbrella) to make things easier for our family. The views were breathtaking. We were celebrating our daughter's college graduation, and the owners left us a lovely note and bottle of wine upon our arrival. We ate our meals on the porch and enjoyed the rope swing. We watched sunsets from the porch and adjacent golf course. The location was a short drive to beaches, restaurants and stores. When we had a very minor issue that we relayed to the owner's handyman as an FYI, we received a personal email response from the sellers. We hope that we can stay here in the future. It was absolutely wonderful! Great location, private and well appointed! Very private location at south end of condo complex, right next to ocean/lava rock shore. Fun to explore tide pools in the lava at low tide. Saw pods of spinner dolphins from the lanai nearly every day. Condo is very comfortable, clean, well maintained and the view is ideal. Wrap-around lanai on 2 sides is very private and provides beautiful ocean views and nice breezes. Note that this 2nd floor unit has no elevator and no air conditioning - not a problem for us at all, as the ocean breezes kept the unit cool and comfortable (we visited in mid-June). No ocean swimming here, but snorkeling/surfing/beaches less than a 5-minute drive away. Close to grocery and restaurants. Would definitely stay here again! Michelle, we are glad you enjoyed your time in our condo and the views from the lanai - would love to have you return! All payments are forfeited if dates are cancelled or changed less than 60 days prior to arrival unless space is resold.